New author Palafox’s illustrated, sardonic sketch of the French and their unavailing military. In this romp through French military history, Palafox sets the tone early with a comical illustration of Oscar Wilde smoking a long cigarette and musing aloud: “They could save a lot of money if they stopped paying people to surrender.” The author begins his survey of military history with the Battle of Tours in A.D. 732, where Charles Martel routed the Muslim invaders and earned the humorous nickname, Charles the Hammer. “So, let us all start out by freely acknowledging that we owe the French a big one on this,” Palafox says, tongue in cheek. “Without them, perhaps, all our women would be in burkas and all our men in turbans. And this’ll, hopefully, be the last positive thing said about the French in this book.” Next, the author reviews the major conflicts fought by the French, with witty accounts of each. Comically titled chapters—e.g., “How to be a Great French Military Commander,” “Famous French Fighting Songs” (intentionally left blank)—feature the Hundred Years’ War, the Religious Wars, World War I, World War II and others. Palafox combines just enough sugar with vinegar to produce a caricature of the French people and their military that’s funny and informative, without being bitter or overbearing. For example, his comparison of the Montreal Expos’ winning percentage to the French military’s win-loss record is amusing and educational. Hilarious, well-placed quotes—some biting, some benign—along with amusing black-and-white cartoon illustrations by Martel and historical summary charts, combine to create a breezy text that’s hard to put down. 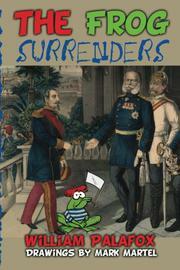 A lighthearted, boiled-down approach to looking back at French military history.